Impressive original color with fine gilt work. Regnum Hiberniae divisum in Quatuor Partes quae sunt Ultonia Conachia Lagenia et Momonia quae et sunt Divisae in Omnes Suos Comitatus. This is a rare large format map of Ireland by Frederik de Witt. 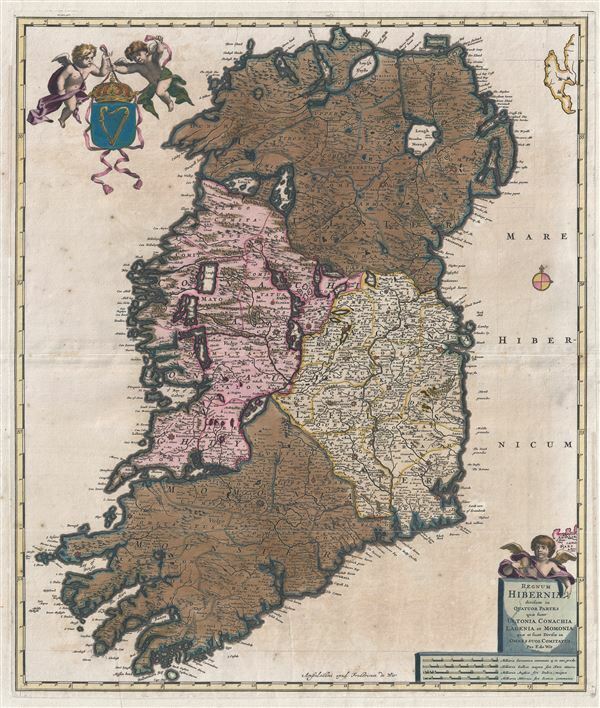 Issued in 1680, the map covers the entirety of insular Ireland in considerable detail. Counties, roadways, rivers, swamps, forests, and mountain rangers are noted. Topography is rendered in profile. The whole exhibits considerable accuracy giving ample evidence to Ireland's long cartographic history. Two decorative cartouches decorate the upper left and lower right quadrants. The cartouche in the top left quadrant features two cherubs and the coat of arms of Ireland. The second cartouche features the map's title, scale and another cherub. The map exhibits exceptionally fine old color work with elegant gold leafing. Issued by Frederik de Wit in the 1680 edition of his Atlas Novus. Frederik de Wit (1629 - 1706) was a Dutch Golden Age cartographer active in the second half of the 17th and the early 18th centuries. De Wit was born of middle class Protestant stock in the western Netherlandish town of Gouda. He relocated to Amsterdam sometime before 1648, where he worked under Willem Blaeu. His first attributed engraved map, a plan of Haarlem for Antonius Sanderus' Flandria Illustrata, was issued around this time. He struck out on his own in 1654. The first chart that De Wit personally both drew and engraved was most likely his 1659 map of Denmark, REGNI DANIÆ Accuratissima delineatio Perfeckte Kaerte van ‘t CONJNCKRYCK DENEMARCKEN. His great wall map of the world and most famous work, Nova Totius Terrarum Orbis Tabula appeared one year later. Following the publication of his wall map De Wit quickly rose in prominence as a both cartographer and engraver. He married Maria van der Way in 1661 and through her became a citizen of Amsterdam in 1662. Around this time he also published his first major atlas, a composite production ranging in size from 17 to over 150 maps and charts. Other atlases and individual maps followed. In 1689 De Wit was granted at 15 year Privilege by the Dutch States General. The Privilege was a kind of early copyright that protected his exclusive rights to print and publish his maps. He was recognized with the honorific 'Good Citizen' in 1694. De Wit died in 1706 after which his wife Maria continued publishing his maps until about 1710. Though De Wit did have a son, Franciscus, he had no interest in the map trade, being a prosperous stockfish merchant. Instead, on her own retirement, Maria sold most De Wit maps and plates at a public auction. Most were acquired by Pieter Mortier and laid the groundwork for the 1721 rise of Covens and Mortier, the largest Dutch cartographic publishing house of the 18th century. De Wit, F., Atlas Novus, 1680. Very good. Overall age toning and offsetting. Minor wear along original centerfold. Exceptionally fine and rare color work with elegant gold leafing.